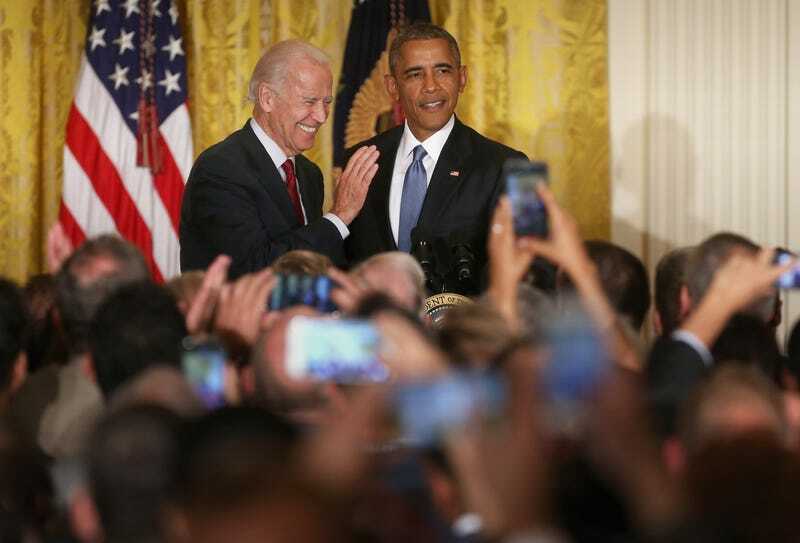 President Barack Obama (right) and Vice President Joe Biden react after a heckler protesting deportations is removed from a reception for LGBT Pride Month in the East Room of the White House on June 24, 2015, in Washington, D.C.
Far too often, we are collectively thrilled with people conveying basic human decency or, in other cases, simply acknowledging the marginalized in ways typically not done by anyone who is a part of the majority. When I was a child, of all things I remember about Bill Clinton, one that sticks out most is this notion of him being our first black president. Clinton was called this because, as a Southern white man from meager means, he not only appreciated certain cultural mores typically associated with Southern black people but also perpetuated select tropes about blacks, like, say, coming from a single-parent household. In the years following that comical claim, it’s been consistently noted that former President Clinton is not our first black president—notably in terms of both policy and the political ascension of our actual, first black president, Barack Obama. Unfortunately, in recent years, some members of the LGBT community—notably the white ones—have not learned from this mistake. In recent years, I’ve seen Obama hailed as “the first gay president.” This claim is rooted in Obama being arguably the most progressive president in our nation’s history with respect to LGBT rights. It is a claim with complete and absolute merit. In 2009 President Obama signed into law the Matthew Shepard and James Byrd Jr. Hate Crimes Prevention Act, which gave the Justice Department the power to investigate and prosecute violence in which the perpetrator selected a victim based on many factors—including sexual orientation and gender identity. A year later, Obama signed a memorandum that protects rights related to hospital visitation and health care decisions for LGBT people. Of course, in 2011 the Obama administration ended “Don’t ask, don’t tell,” the military policy that prohibited qualified gay and lesbian Americans from openly serving in the armed forces. There are many, many other examples that speak to the testament of the Obama administration’s commitment to advancing the quality of life among members of the LGBT community. Just this year, Obama is set to declare the first national monument recognizing the struggle of LGBT rights. Of course, this list of accomplishments goes far beyond simply being decent and willing to acknowledge the disenfranchised. And yet, as instrumental as Obama has been on LGBT rights, when it comes to anointing him with labels like “the first gay president” or “the gay president,” it is prudent to remember that Obama is a politician. Yes, Obama is a shrewd politician, for sure, but a politician all the same. Indeed, let us never forget that in order for Barack Obama to even become president, he had to feign disapproval of marriage equality at a time when it was not widely supported by the electorate at large. Most, however, remember his May 2012 interview with Robin Roberts in which he was in support of marriage equality because he had “evolved” on the issue. This is a politician at work. Those very religious people he mentions in this ABC News interview would include the likes of Rick Warren, who not only championed Proposition 8 but also contributed to the religious justification of oppressive anti-gay laws across Africa. Warren gave the invocation at Obama’s inauguration. There’s also much reason to question whether Obama truly needed to “evolve” on marriage equality. Though his administration would later argue that someone else filled it out, in 1996, as a candidate for the Illinois Senate, Obama declared that he supported marriage equality. One might not be surprised by that, given that he was a constitutional law professor in a previous life. In any event, his former political adviser David Axelrod acknowledged that Obama misled the nation when he claimed to be against marriage equality in the 2008 race. Obama deserves all the credit in the world for what he has accomplished with respect to advancing LGBT rights. Nevertheless, be very clear that in order to do so, he feigned discomfort with marriage equality to pacify voters in the pursuit of power. That doesn’t deny his political savviness, but it does disqualify him from being the “first gay president”—no matter what any white gay writer tells you. Speaking of, it is easy for white gay people and mainstream media to forget that the LGBT community encompasses black and brown faces. Black people are self-identifying more as LGBT than any other group. Black or Latino gay couples are reportedly twice as likely as whites to be raising children. When there are critiques about Obama not specifically addressing the economic plights of racial minorities (he once notoriously declared that he is not the president of black America), that includes members of the LGBT community, too. The same can be said of incredibly high HIV rates among black and Latino gay men. This does not negate any of the aforementioned feats of the Obama administration, but it does remind us that those who have far less political capital can often see their needs go unaddressed. Let us acknowledge what has been done. Obama has many milestones when it comes to advancing the basic human rights of LGBT people. And yet we needn’t canonize him or any politician. Let us not be so quick to attach labels like “gay president” to people who, while helpful, don’t fit the bill. I am grateful for what has been done, but we have far more to do. "Scold-in-Chief? The Love-Hate Relationship Between HBCUs and President Obama"